“Austria reminds me of Switzerland, but a bit rougher around the edges”, I recall remarking to Christina about halfway through our trip. And it’s true – in fact, it was the spell cast upon me last year in Switzerland that drew me back into the Alps to give them another go. And those Alps are certainly just as stunning and imposing on the landscape in Austria as they are across Switzerland. While the Swiss were all tidiness, orderly, and a bit buttoned up, Austria was a little more relaxed; laid back. A bit more scuffed up and lived-in. Not that it’s a bad thing – Austria has character and charm, and plenty of it. Our journey began by flying into Munich, Germany. We arrived early in the morning of December 23rd to a complete lack of snow in the region – unusual for this time of year. In planning for this trip, many of the best hikes, I was told, would be snowed over and unusable, leaving me to research and note various winter walking paths, snow shoeing, and cross country skiing opportunities. Despite having been banking on a beautiful, snowy December holiday for months, I was actually thrilled to find the landscape looking as though we were in the midst of a summer trip! It didn’t take long for it to dawn on me that many of the summer hikes I read about in the area would actually be available to us. The plan here was 4 nights in Salzburg (with day trips to the surrounding areas), 2 nights in Innsbruck – the capital of the Tirolean region of Austria, then onward to Schwangau, Germany in the shadow of the Neuschwanstein castle, and finally into the university town of Heidelberg, Germany. From Munich airport, we navigated the train system to get to the German border town of Freilassing, where we were to pick up our rental car. Freilassing is only 10 minutes across the border from Salzburg, and since were were ending our trip in Germany, it made sense to rent the car in the same country we’d be returning it to to avoid country change fees. If I said the whole process of getting ourselves from Munich to Salzburg was simple, I’d be lying to you. I had impeccably planned this trip, as I tend to do, and had every point of interest, rental agency, train station, hotel, apartment, restaurant, etc. marked on the “My Google Maps” app, complete with descriptions. It should have been very smooth, knowing where everything was and a little digital voice telling you how to get there if need be. What I didn’t bank on was the free 3G coverage that T-mobile offers you while in Europe was insufficient to load my maps and update our positions in real time. Months of planning out the window. We now needed to rely on physical maps written in German, broken conversations with locals with our limited German language skills, and a lot of guess work. What should have taken us an hour and a half to get from Munich to Salzburg ended up being closer to 3 hours, with much dragging our heavy luggage all over the place. 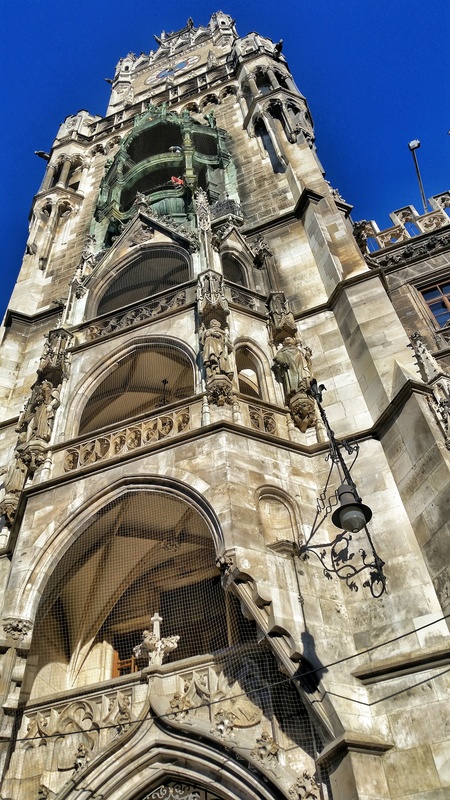 I did manage to take literally one photo in Munich of the famous clock in the Altstadt after emerging from the underground for 5 minutes to just get a quick look at Marienplatz. So now I’ve seen Munich – 5 minutes counts, right? 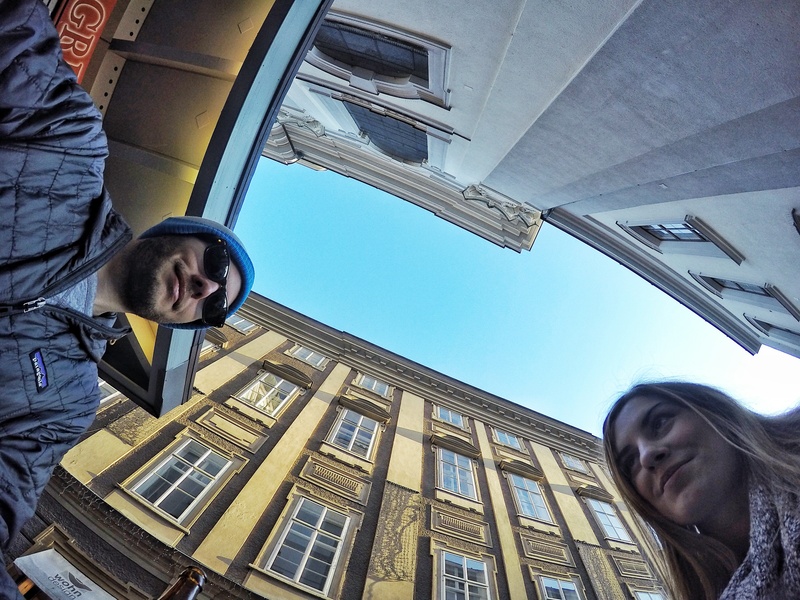 The street on which our apartment was located – Getreidegasse. Upon arrival in Salzburg, we found our way to our apartment in which we would be staying for the next 4 nights, and we were quite impressed with its size and location. After being warmly greeted by the owner, Manfred, we were ushered upstairs in this ancient building that has been converted into a 6 room apartment complex right in the heart of the Altstadt, and about 3 doors away from Mozart’s birth house (Mozart’s Geburtshaus). 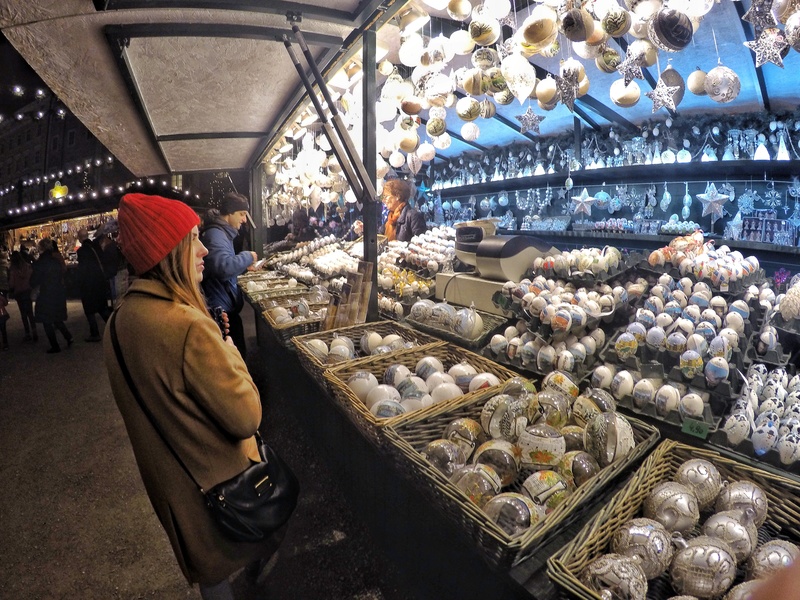 Located in a small alley just behind our apartment was a small Christmas market (known in German as Christkindlmarkt) called the Stern Advent Market. This was our first stop after putting our bags into the apartment, and would be our first real foray into the city of Salzburg. We spent a little bit of time visiting the booths here before wandering along to the larger Advent Market in town located in the large Mozartplatz square. There were numerous advent markets set up around town, but this one was the largest of them. We enjoyed the atmosphere – the combination of the lights, sounds, decorations, and smells of traditional German food made us feel for the first time that we had really arrived in another country. Christina browsing one of the many stalls at the Christkindlmarkt at Mozartplatz. 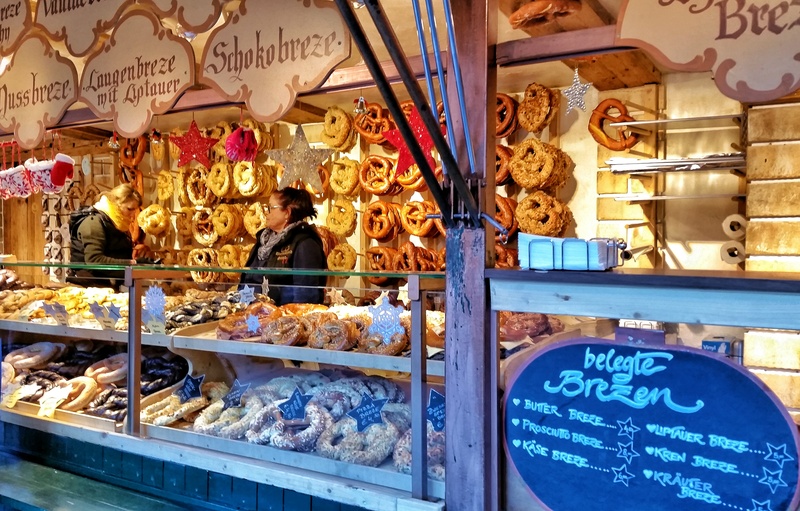 Pretzels were a common sight in the markets, and we certainly ate our fair share, at least one a day! 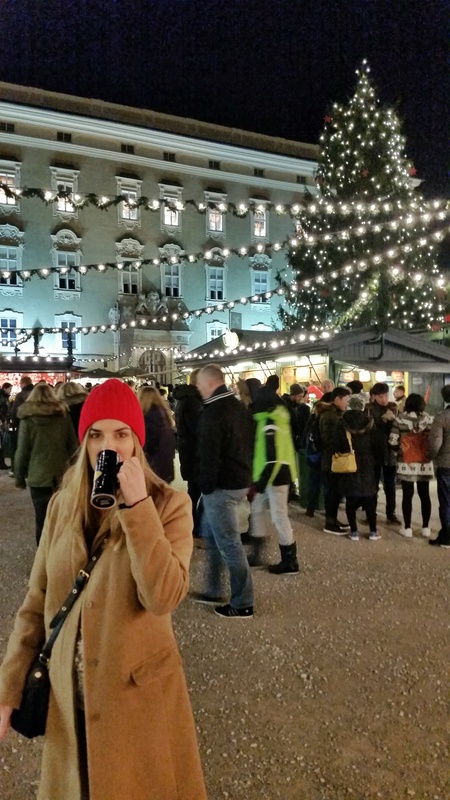 One of my favorite aspects of the markets was the Gluhwein, which is a warm, spiced wine, usually made with orange zest and served in mugs. 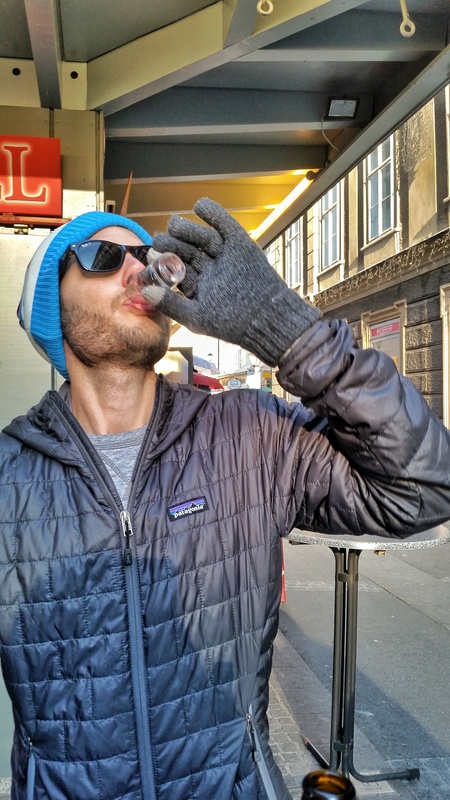 Gluhwein was ubiquitous in both Austria and Germany, and was great for warming us up during the cold winter nights. Typically, standing tables are set up in various spots around the markets where revelers chat away while drinking the warm beverage – a deposit is placed on the mug which is given back to you if you return it (about 2 Euros was the normal going rate), but we chose to keep some of our mugs to bring home as mementos. The city was mostly quiet this evening, and beautifully decorated for the holidays throughout. Looming above it all, the imposing Hohensalzburg Fortress kept watch on us, perched high up on its rocky hill above the city, illuminated for all to see. The following morning was Christmas Eve, which in Austria is the main event! 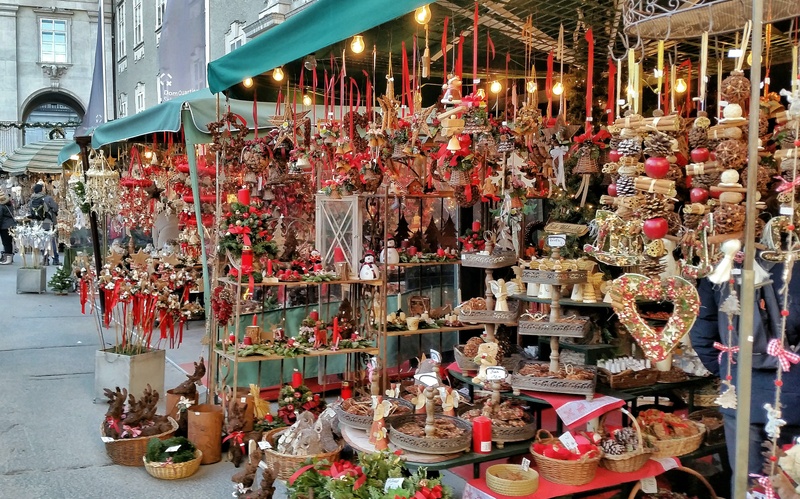 Austrians tend to celebrate their Christmas on the 24th, and therefore the town shuts down early on that day in order for workers to go home and be able to celebrate with their families. 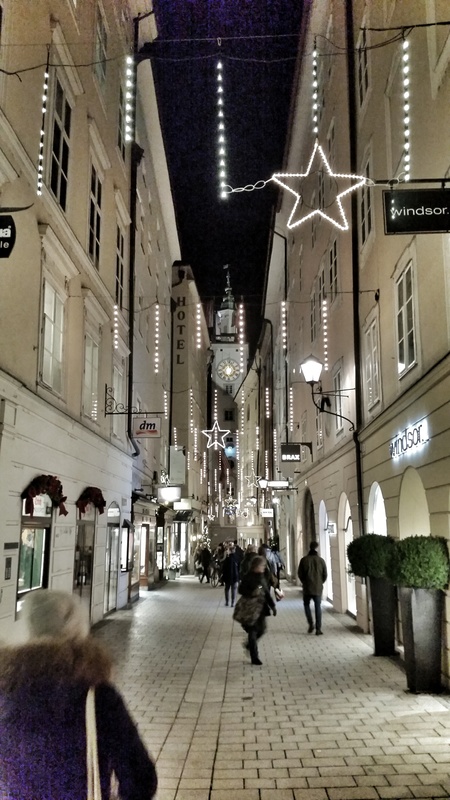 You will also find that today, church bells and radio stations throughout the city play “Silent Night” (Stille Nacht) on a loop, as the song was written here in Salzburg. Beginning around 4 PM in most Austrian homes, the Christmas tree is only just now decorated while the family sings carols, and then the presents are placed under the tree. The Christmas meal is traditionally eaten on this evening. From high up on the fortress, rifles (with blanks, obviously) are fired into the air at various intervals to announce the arrival of the Christkind, who brings the presents to the children, rather than Santa Claus. I began the morning still jacked up from jet lag, and awoke at 3 AM, fully rested and unable to go back to sleep. At this time of year, the sun doesn’t rise until 8 AM, so I decided to take advantage of the early hour, and get a glimpse of the city without tourists. I headed out the door to find a completely deserted city. Cold, and a little disoriented from being in a foreign city at such an ungodly hour, I walked the streets, taking it all in. 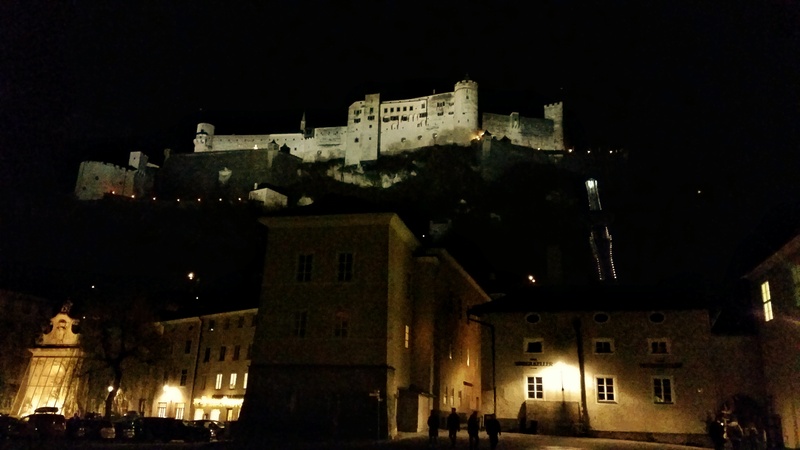 I found my way across the river to the Kapuziner hill, which climbs high above the Altstadt (old town) with a great view of the fortress and the Untersberg – Salzburg’s mountain. I staked out a spot at the top of the hill here in a clearing, with a wide open view to await the sunrise. I wanted to catch the city of Salzburg, the fortress, the mountain – all of it – in that Golden Hour, the perfect lighting situation for photography just after sunrise. I stayed in my peaceful, quiet spot on Kapuziner, watching the city sleep for a while, until finally, the sun began to peak out from behind the foothills surrounding the city, and eventually cast its orange glow upon everything around me. Just what I had been waiting for! At this point, I wandered down the hill back into the Altstadt to find the narrow streets completely devoid of people, a rare thing in a city centered around tourism. 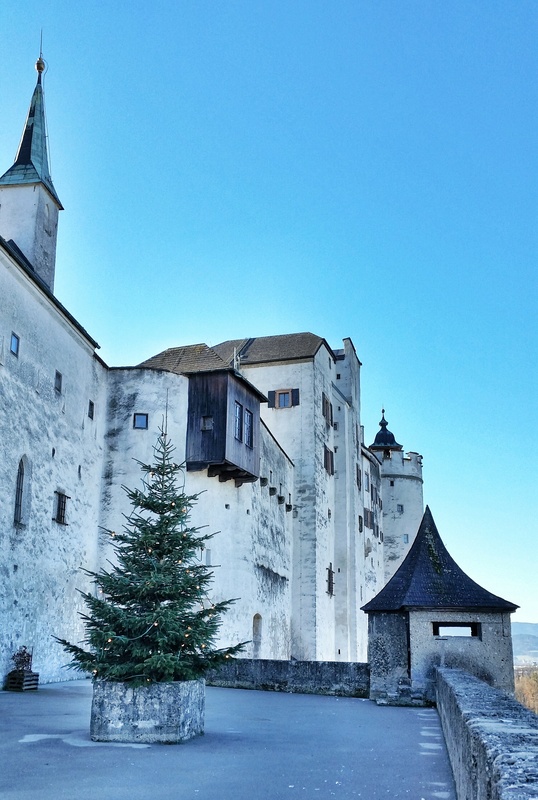 With the city shutting down by 4:00 PM today, we wanted to make sure we got in as much as we could in the time we had, with our first stop being the Hohensalzburg Fortress. 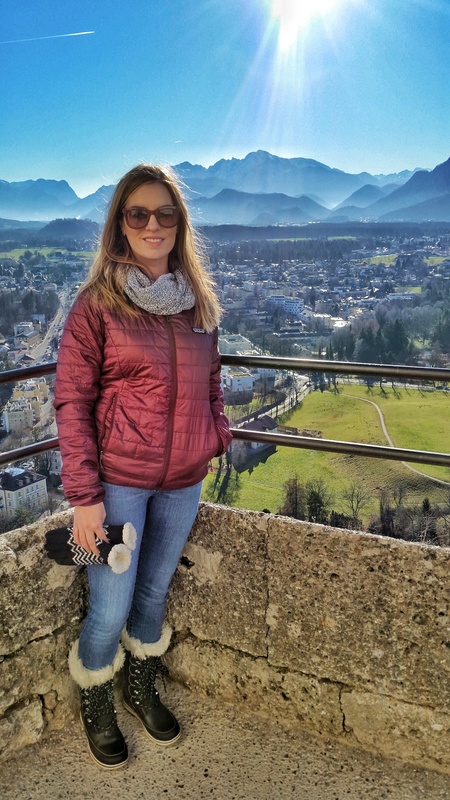 The views from the top were spectacular, giving us a commanding view of Salzburg and it’s surrounding mountains, villages, and foothills. After wandering the grounds of the fortress, we walked out onto the trails that meander around Monchsberg, the hill on which the fortress sits. At a fork in the trail, an older gentleman approached us and began speaking in German. “Sprecken sie Englisch?” I asked him. “Ah yes, English!” he replied. “Where are you from?” “America”, I responded. “Texas”. “Ah, Texas!” The man was smiling broadly now. “George W. Bush! One of the greatest terrorists the world has known!” This was a common theme during our time in both Austria and Germany – mention that we are American, and immediately they bring up Donald Trump or George Bush. Unsurprisingly, Trump is not giving the greatest impression of American values or ideals to people abroad. As it turned out, the friendly man who stopped to talk to us was telling us that we should instead take the left fork in the path, as it offers far greater views, and ends up in the same spot as the right fork that we were about to take. He ended our conversation by saying that he has been lucky enough to have this view and live in this wonderful city his entire life, and wished us well by giving Christina two big kisses on the cheek, and removing his gloves to give me a hearty handshake. We were glad for his advice, as the views on the path he suggested were stunning. Here you see the Salzach river, and the Kapuziner hill directly across the river, the hill from which I photographed the fortress earlier that morning. After visiting the Christkindlmarkt again (in the daylight this time), we stopped at a street stall to grab a couple of drinks and do some people watching. It was at this time that I decided to go with Austria’s national drink – Schnapps. It was the perfect way to get all warm and fuzzy on a cold Christmas Eve. The local hanging out at the stall as I ordered gave me a broad smile and complimented me on my perfect choice of drink, and wished me a Frohe Weihenachten. We made reservations well in advance at the Hotel Elefant restaurant, who offered a 4 course vegetarian meal in addition to their regular Christmas Eve offering. It was a great choice, and a perfect end to our first full day in Salzburg. The following day, December 25th, we were off on a day trip to the Salzkammergut lake district, and the Zwolferhorn mountain, high above the Wolfgangsee (lake). Click here for part 2. Thanks for a great trip report and photos, Justin! It certainly brings back sweet memories of our trip there in summer of 2013. 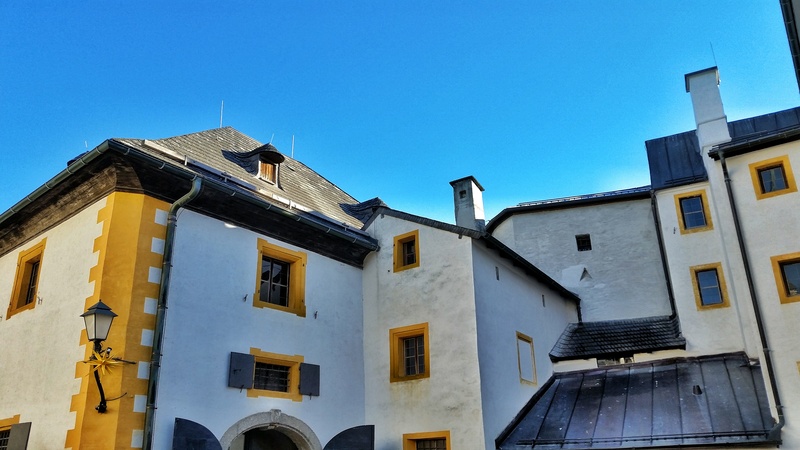 We stayed in cosy and friendly Blaue Gans on the same Getreidegasse and visited pretty much the same places as you did plus Schloss Hellbrun (20 min. from Salzburg) and Mount Untersberg (about 10 miles south of the city) and then went to Fussen which we used as a base to explore Neuschwanstein and the surrounding area. Looking forward to reading the rest of your report. I bet it was even more beautiful in summer with all the green everywhere! Untersberg kept calling my name, but unfortunately we never had a chance to make it up there. Thanks for reading! My boyfriend and I are considering going to Salzburg this year and I was trying to find a blog review somewhere to see if we fancied it. It looks beautiful. We’re hoping to go in the spring, lots of hiking opportunities! 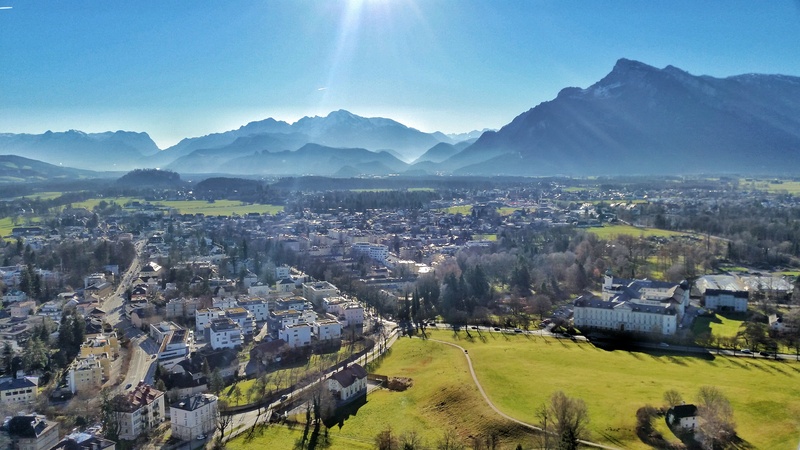 Salzburg in the spring would be incredible – definitely plenty of hiking to be found! We only went a little way up Kapuziner hill in Salzburg itself to get the photo of the Altstadt from across the river, but there were tons of trails that went further up the hill that I would have loved to explore if we had more time there. Enjoy your trip! Great post! 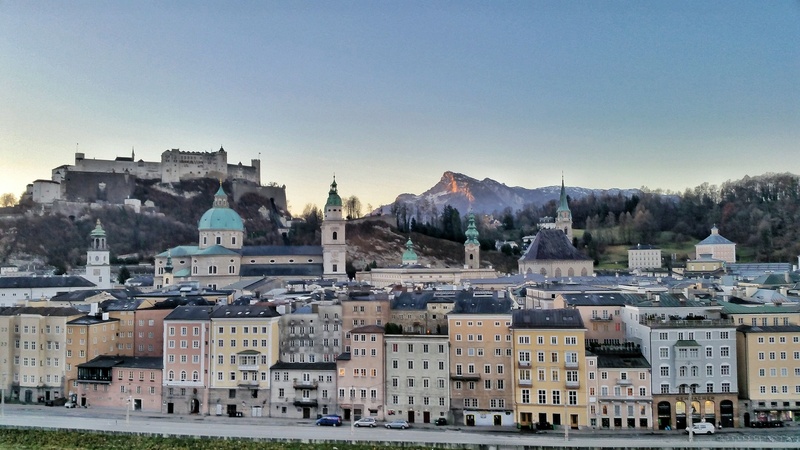 You brought back fond memories of when I visited Salzburg as a daytrip form Munch in December 2014. The city is absolutely adorable as it is and even more so during the holidays. Glad you had such a nice experience too. Thanks Jessica, Salzburg certainly was a pleasant surprise. I can only imagine how nice it is in the summer when everything is nice and greened up! 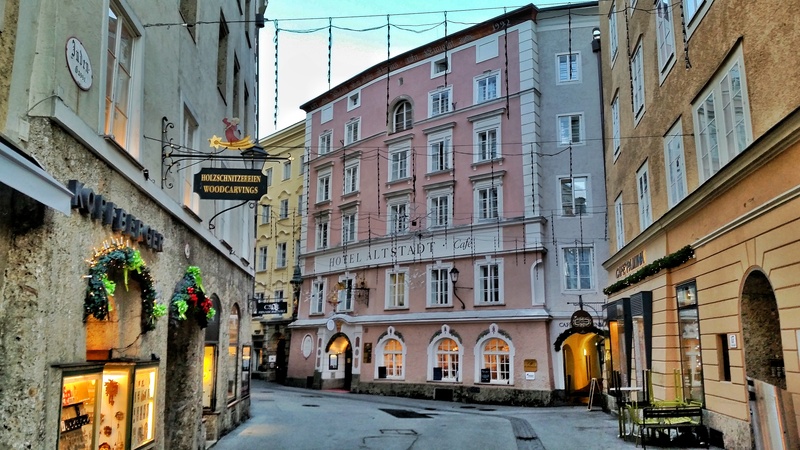 If you plan to stay in Salzburg for longer than one night you will need to find a place to stay. 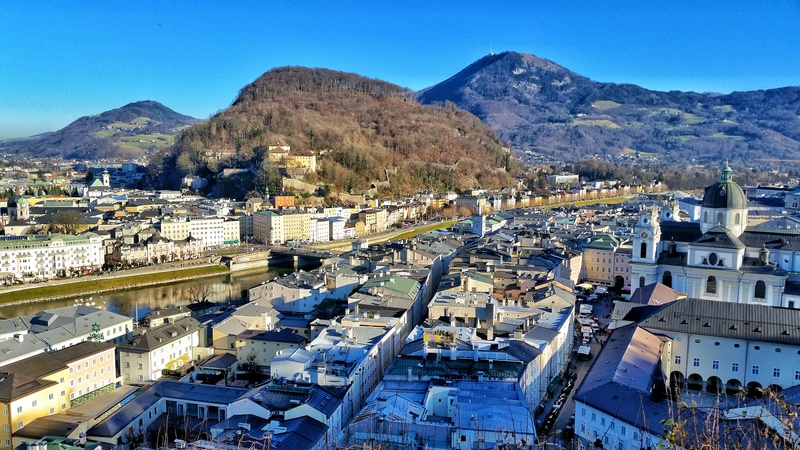 Salzburg has a wide range of places to bed down these consist of hotels at the high end of the star range to lower end hotels, bed and breakfasts and hostels. 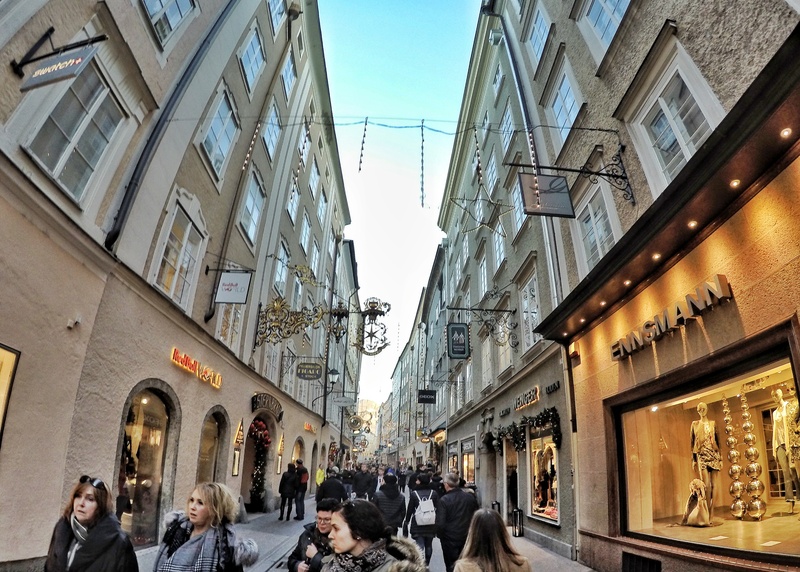 If you are visiting the city on business ensure the hotel you decide to select has the business facilites that suit your needs, check the area location is good as traffic in Salzburg can cause problems at certain times of the day. 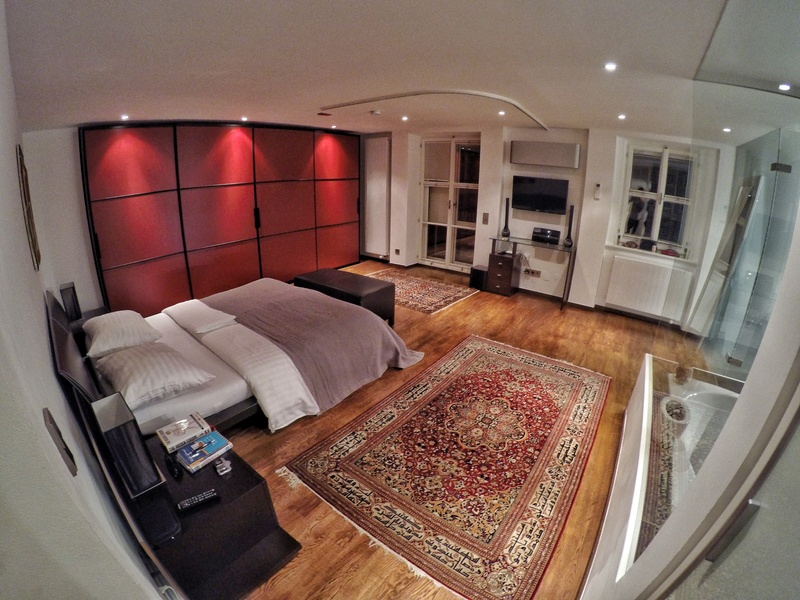 If you are seeking out more luxury accommodation there is a selection of top chain and independent hotels. Salzburg also offers a good selection of lower star hotels that offer simple but functional facilities for visitors to the city. If you are visiting on a small budget there is a number of hostels and guest houses in the city which are a good place to rest your head. 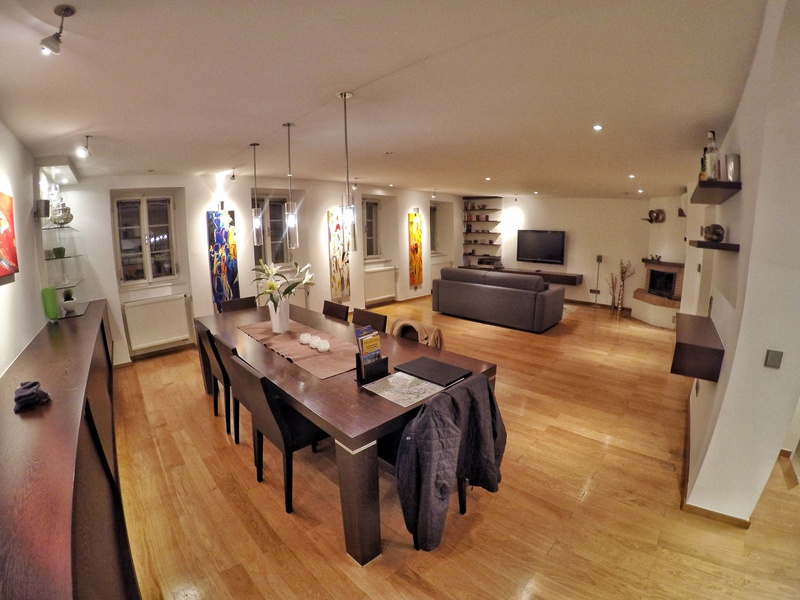 Whatever accommodation type you select in Salzburg try and make time to see if any bargains exists on a wide array of travel web sites, often when there is a big event on in town. I found this is an informative and entertaining post, so I think so it is very useful and knowledgeable. I would like to thank you for the efforts you have made in writing this article.